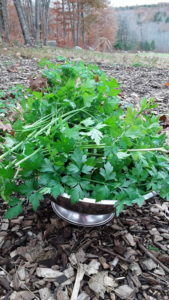 Dried parsley, fresh parsley, in the ground, in containers, as a garnish, as a medicinal, the benefits of parsley for your health and your garden are many. 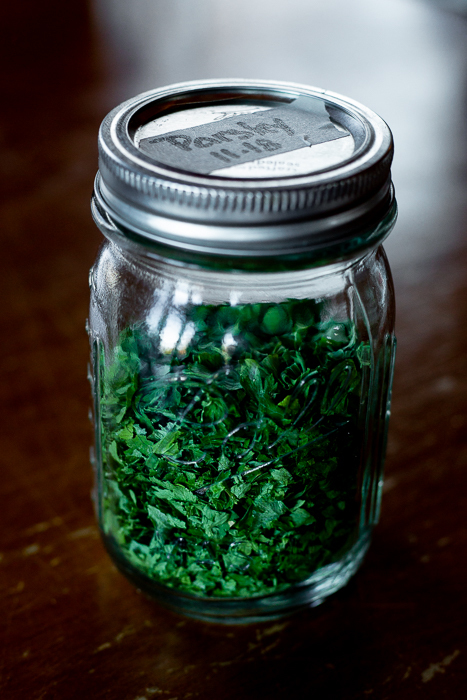 Parsley is an unassuming herb you just may want to start growing today! Our health can benefit greatly when we add parsley to our diets. It is full of Vitamins A, B (Folic Acid), C and K, Iron, Potassium and is a Natural Diuretic. Parsley has also been shown to significantly suppress swelling in joints due to its anti-inflammatory properties. For those who want to reduce their sodium intake, the flavor added by using parsley, lessens the need for added salt. Looking for an all natural diuretic with some anti-inflammatory properties? Give this fresh tasting smoothie a try. Place all of your fresh ingredients in your blender and whirl away! It is a great way to start your morning, or a nutrient rich way to give your health a boost before you go to bed. If the consistency is an issue for you, a juicer could be used as well. You will be missing out on all of the benefits of the fiber, but the parsley and other ingredients will still have powerful health benefits. And as a side note…the lemon and ginger in this smoothie also boast anti-inflammatory properties. BAM! I enjoy planting an Italian garden every year. In the same area, I plant, tomatoes, peppers, onions, parsley and basil. It gives me the ability to quickly harvest everything I need for a quick fresh pasta sauce and each plant loves their garden neighbors. Its a win-win! Parsley also benefits your garden by making an attractive buffet line for the Black Swallowtail Butterfly. They will eat your parsley, so plant extra just for them. But their efficiency in pollinating your garden will outweigh any “damage” they may do. It is also said, that in caterpillar stage, the Black Swallowtail sends off an odor that is not attractive to other insects, thus acting as a natural pest control. Parsley is a beginner gardeners dream! You can direct sow parsley or start it indoors in trays and transplant when the weather warms. Parsley is also a perfect candidate for container gardening and compliments basil, thyme, and oregano well. One of my most favorite gifts ever was a large container filled with these beautiful herbs! I am sure most of us have a spot that a herb container would look right at home. As parsley thrives in cooler temps, you will want to direct sow your seeds 4 to 6 weeks before your last frost date. As this timing is different for every region, just make sure to check a reliable source like, The Old Farmers Almanac. Or, if you want to start them inside, you can plant them in seed starting trays 6 to 8 weeks before your last frost date. I say both! Why not enjoy your parsley all through the season. At the end of the season, you can simply cut off the remaining stems and leaves. 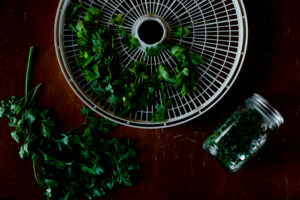 Rinse them, blot them dry with a paper towel, trim off the long part of the stems and get them into your dehydrator. No dehydrator, no worries! Your car makes a great dehydrator. Take a window screen and spread your fresh leaves out in a single even layer. On a sunny day, lay that screen inside your vehicle and close up all of the windows. Your vehicle has now become a dehydrator! Check after a few hours. When the leaves are dried to a point you can crumble them, bring them inside and start another batch. When using fresh parsley vs. dried parsley, you do need to be aware that measurements differ. Check your recipes to find out if they call for fresh or dried. Three times as much fresh parsley is equivalent to one amount of dried parsley. 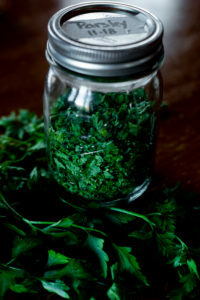 And parsley fresh or dried, it doesn’t matter, you still get the amazing health benefits! We hope that this encourages you to try growing parsley this year. It brings such freshness and flavor to any savory dish, beauty to your garden and color to your plates. With that in mind, we can almost think of the benefits of parsley for your health and garden, as a botanical bonus!